I'd wanted some weighted gloves for my workout for ages, but I could never find any that I could afford. Plus, for the most part, they were all quite fat and ugly, but that's not really something that one can be picky about when things like this are concerned. But one day, I found these delightful little gloves, by Powerhoop. They were cute, but pricey, and they had several weight options, so I decided to buy them. Typical me, I wanted to buy a heavier pair, but I decided that that might be a bad idea after having no experience with them, so I begrudgingly purchases the lightest size of Powergloves. I will start by mentioning my single complaint, and that is that, on Amazon (without too much checking around, admittedly), they were advertised as 0.5kg, 1kg and 2kg. It took me over a month to realise it, but when I looked at the box they came in to actually write this post, I found that the box said 0.25kg each. I was under the impression that I had bought a pair of gloves which were 0.5kg each. Though I have to say, after my experience with them, if they had been 0.5kg each, it would have been a bit much to start with. But that was a bit misleading. Although now I think about it, they did weigh considerably less than a single dumbbell. I suppose it should have been obvious! Having said that, they are truly excellent gloves, and it was only the way they were presented on Amazon that had caused my disappointment. Fortunately, as I said, it has taken me 3 weeks to notice this, and in these past 3 weeks, I've never let them out of my sight. Unlike the other gloves I had seen, these are really quite feminine. The weight, which feels as though is full of sand (but is actually particles of iron), making it more comfortable to wear, is focused on the back of the hand, so your palm and fingers are free to move around and pick things up if you need to, making it perfect for use with dumbells, kettlebells, barbells, and simple tasks like sweeping and cleaning and things like that. The fabric is a thick foamy material, which is also very comfortable, and the gloves are fixed by very strong Velcro. The Velcro patch is quite long, which allows for very appropriate adjustment. They are a delightful purple colour, though I believe the colour changes depending on the weight of the gloves, and I have to say, I really rather love them. To begin with, there was a black band left around my wrist and thumb, but I have to be honest, it came off in the shower, and I'm not the type to freak out about such a thing, anyway. One thing I have realised from these Powergloves is that they can help with dumbbell weights. Typically, dumbbell sets come in threes or fours, and consist of 1kg, 1.5kg and 2kg weights. Once you've adjusted to the highest you can always buy another set, but 2.5kg+ tend to be more expensive. Powergloves, on the other hand, especially if they are rounded weights of 0.5kg each, can more or less give you another dumbbell. I've actually lost my other two dumbbells, so all I have left are my 1kg ones. Naturally, I adjusted to those quite well, but I have to buy a whole new set to increase my weight workouts. But with these Powergloves, I'm able to use my dumbbell at the same time and increase the weight, and when I move onto a workout that requires use of my hands, I can still keep the weighted gloves on. I highly recommend them. I intend to buy the next weight up shortly, and I'm also hoping to get a new set of dumbbells anyway. 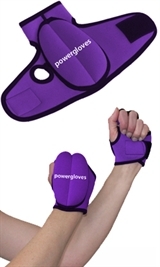 Powergloves are made by Powerhoop, which is a brand of weighted, padded hula hoops. I don't own one - but I'd certainly like to! Who doesn't love hula hooping?! Just make sure you warm up properly first, or you'll end up with a stitch. At least, I will. Goodbye Google Reader, Hello Bloglovin. New Bat Plush PDF Pattern Available!